Feeling like you’re in a fashion rut? I know, I’ve been there. Well, actually, my fashion rut was more of a hit and miss marathon. I would vary between feeling confident about what I was wearing and feeling just plain off. I never realized it was because I wasn’t dressing authentically. 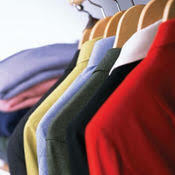 Dressing authentically is creating a style that works for your coloring and personality. Although it may seem daunting at first, there are really just 3 simple things to consider when you are ready to refine your style and love your wardrobe. The first step to love your wardrobe is to know your best colors. I believe that the best tool for this is a professional personal color analysis. When you use personal color analysis to discover the best colors for you, you get a handy color palette. This doesn’t mean that you can’t wear other colors nor that you only look good in the 50 colors provided for you. What it means, rather, is that you get a curated color palette just for you! When you use this palette to build your wardrobe and makeup drawer, everything you wear is harmonious with your coloring and with each other. I discovered personal color analysis a few years ago while researching how to have a minimal wardrobe. Knowing my best colors was life changing for me, seriously. 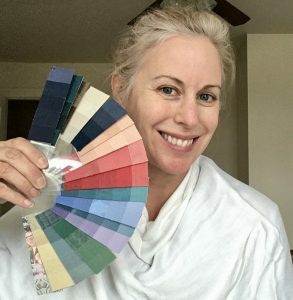 So much so, that I wrote a whole post on it HERE, The bottom line is that before I knew my best colors, I didn’t like what was staring back at me in the mirror. They say that our own personal mirror is 150% of what others see. Meaning, I saw my flaws magnified and that’s all I concentrated upon. I think the central issue was that I had a closet full of black. Since black magnifies my flaws, of course that’s all I saw! Once I started wearing my best colors, I saw myself as a whole again and not the flawed pieces. After my color analysis, I finally knew the right colors for me, but was having a hard time putting it all together. Part of my hit and miss marathon issue had to do with trends or what looked good on others. My misses were in large part due to trying a trend that just didn’t work for me. i loved it on someone else, but it didn’t feel authentic to me. 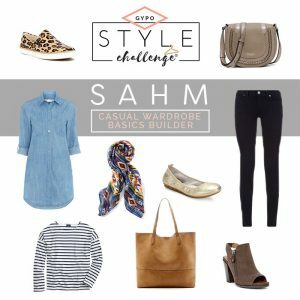 My first capsule wardrobe and style challenge with Get Your Pretty On changed all of that. Not only did it help me discover how to incorporate trends in a way that was authentic to me, but it also helped me wear more of my own clothes. I know that many of you are loving subscription and box type programs, but I honestly don’t think that helps you refine your style. Having someone shop for you, doesn’t teach you how to shop for yourself. Unfortunately, I think those programs keep you on the “hit or miss” train with your style. So, how is the Get Your Pretty On program different? Alison Lumbatis, the founder, and her team put a new capsule wardrobe together every season. It is always filled with a ton of wardrobe staples plus a few current trends. It’s different, because you are encouraged to shop your closet and make it your own. How do Style Challenges Work? It works in stages, First, you’re given a shopping list of pieces for the capsule with lots of ideas for every shape, size, style and budget.The idea is that you shop your closet first and then buy a few items of your choice if you need or want them. Once the shopping period is over (about three weeks), you start wearing your outfits.You are given a month’s worth of outfits, so it’s easy to plug and play with the pieces you’ve chosen. You can choose to post your outfit of the day (OOTD) in the private Facebook group or not.The group is full of supportive and encouraging ladies of every background and size. I truly enjoy participating and learning from everyone’s interpretation of each of the outfits. At $39, the GYPO Style Challenge is a bargain. It is the easiest way to rebuild your wardrobe and stay on top of seasonal trends. It’s a ‘challenge’ because you’re challenged to get out of your comfort zone and try new styles. If you are wondering whether it is worth it or not, never fear, you are eligible for a full refund during the first week of wearing the outfits. 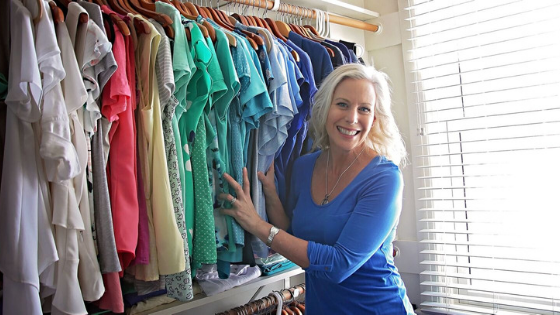 If you don’t have a lot of basic items to begin with, you might consider starting with the Closet Staples Casual Wardrobe Builder. This capsules would give you a solid foundation to build upon with future capsule wardrobes. Once you know your best colors and get a little help in the style department, you should consider tracking what you wear. Refining your style and loving your wardrobe doesn’t have to take a lot of work, but it does take intention. Tracking what you wear and how you felt in the outfit is the single best thing you can do to refine your style and love your wardrobe. If you are doing the GYPO Style Challenge, then you can track how you felt about your outfits right on your print out. Also, if you choose to post outfit pics in the private group, you will have visual evidence of what you wore. Taking a picture of your outfit helps you to see, more objectively than a mirror, whether something is working for you or not. If not, then you might just jot down what you wore in a journal. A super simple method for tracking what you wore is to use an app. There are a ton of options out there, but I think simple is best. My favorite app, due to its simplicity, is Wardrobe Journal. It’s available on I-Tunes for 99 cents. It enables you to quickly take a pic of what you wore and add some quick notes. Nothing is more impactful to refining your style than tracking what works best for you. 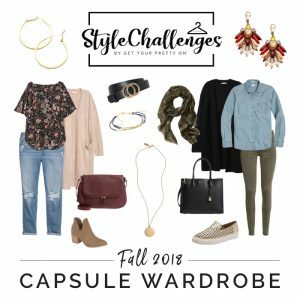 Have you tried a capsule wardrobe or style challenge? What did you think? This post contains affiliate links. This means that I get a small commission if you purchase through the link, which helps me to continue to post on this blog. I don’t receive any discounts for my own purchase. All opinions are my own and based on my personal experience. Sound advice! Investing in professional color analysis (like yours!) and a style group like GYPO will save you so much money in the long run because you won’t waste money buying clothes that just hang in your closet because they don’t actually work on you. Thanks, Carolyn! It’s always great to see you in the challenges looking beautiful in your Autumn colors! I loved my Summer Capsule from GYPO, fall will definitely be awesome too. I haven’t heard about the journal app, thanks for the suggestion! Hi Alicja! So glad you are enjoying GYPO! I find that the app makes it easy to keep track of what I wore and where, so I don’t repeat with the same people! Wow! I feel like I’ve learned a lot in this one post. I do have clothes I love, and those that stay on the hanger, and it has more to do with color than anything. So glad you got something out of the post – thanks!